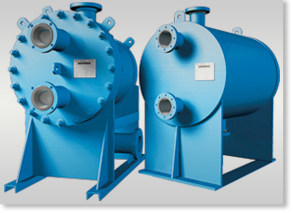 Hayes Pump offers a selection of Tranter heat exchangers, which produce heat transfer by using plates instead of tubes. As a result, Tranter products are compact units with smaller heat transfer areas relative to conventional shell and tube exchangers. Hayes Pump distributes Tranter heat exchangers to the Commercial, Municipal, Industrial and Power markets in New York and New Jersey. Request full product details using form on the right. Superchanger heat exchangers provide maximum efficiency in transferring heat either from liquid to liquid or from steam to liquid. Design features a series of gasketed, embossed metal plates bolted between end frames. Handles temperature approaches of less than 1°C. Offers “U” or “K “ values 3-6 times higher than shell & tube exchangers. Standard: A high integrity welded pressure vessel not designed for mechanical cleaning. Removable Core: A fully accessible HE with a removable cover plate for mechanical cleaning or inspection. Two-in-One: A heat exchanger with two separate plate packs in one shell that can handle 2 different fluids. Multipass: An HE offering multiple concurrent passes through separate plate pack zones on both plate and shell sides. Platecoil heat exchangers provide uniform, efficient heat transfer for gas cooling, jacketed heating or immersion heating, and more. Available for a wide variety of shape, size, pressure containment, material, capacity, and surface finish requirements. Close temperature approach capability (less than 1°C). Suitability for challenging applications involving steam, gases, liquids, and two-phase mixtures, at temperatures and pressures beyond the capability of gasketed plate & frame units. Whether you need local inventory or support for Tranter heat exchangers, Hayes Pump can meet your needs. As a factory-trained distributor stocking Tranter products, Hayes Pump can provide knowledgeable service, parts, and heat exchanger solutions. Hayes Pump operates factory authorized maintenance facilities for Tranter products. Tranter heat exchangers are suitable for a wide variety of applications in Chemical Processing, Hydrocarbon Processing, Oil and Gas Production, Power Generation, Renewable Energy, Marine, Refrigeration, HVAC, and General Industry. Tranter was founded by R.E. Olds in 1932 as a manufacturer of eutectic plates for refrigerated delivery vehicles. 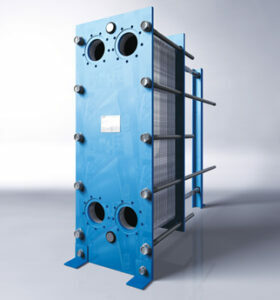 Subsequently, Tranter has maintained a leadership position in heat exchange manufacturing and development through repeated developments like the PLATECOIL Prime Surface Heat Exchangers first introduced in the 1940s. 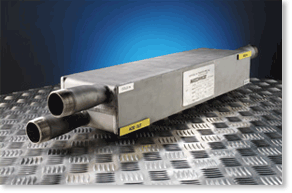 Through expansion and acquisition, Tranter has grown to provide compact heat transfer solutions worldwide. The company’s products span a wide range of advanced plate heat exchangers, offering proven performance in applications that involve gases, liquids, steam, and two-phase flows.